With no international bond maturities due from 2019 to 2021, the Government is looking to tap the global capital market for a very long-term $ 1 billion through an international sovereign bond (ISB) by the end of May. “We are rectifying the error created previously by looking at the short term. Now we are looking at a sounder, long-term facility, 15-30 years where there is no cost on the opportunity,” Finance Minister Ravi Karunanayake told journalists in Colombo. With the International Monetary Fund (IMF) having expressed further confidence in Sri Lanka for moving its economy in the right direction, Karunanayake said there was a growing appetite for long-term instruments. He said a total of seven lead managers have been appointed to raise $ 1 billion through ISB by the end of May. “Apart from the regular banks and investment houses such as Citigroup, HSBC, Standard Chartered and Deutsche Bank, the Government has selected Morgan Stanley and two Chinese institutions namely IDBI Bank and CITIC Bank,” he added. Highlighting the successful inflow of various syndicated loans almost up to $ 1 billion on the cards and the Hambantota Port deal with China, the Minister expressed his confidence that the country’s foreign reserves would comfortably reach $ 10 billion by the end of the year from about $ 5 billion at present. He said the Government’s intention was to create value addition to the reserves and not to have “hot money”. “There is no point having hot money which is off borrowed funds. The previous regime pushed Bank of Ceylon, People’s Bank and NDB to collect on their balance sheet and brought reserves into the country, which is all hot money,” he added. Karunanayake stressed that these reserves were not just for consumption-oriented payments and assured that there were no loans adding on to the non-productive expenditure of the economy. “Remember, this (2017) is the first time that Government is heading where income is sufficient to pay recurrent expenditure,” he noted. Further, he emphasised that the proposal to bring in the Voluntary Declaration Act would allow Sri Lankans keeping their money outside to bring it back into the economy, which were 100% collateral-free reserves. However, the Minister said these prospects were subject to world economic turbulences, adding that Sri Lanka had been able to weather the storm and go through the worst of times to the best of its ability. The Minister claimed that despite the fact that some parties were trying to show that foreign reserves outflow was significant in the economy in the latter part of last year, with Templeton Investment Group pulling out of the market, the inflow has started to pick up. “Templeton, which brought in $ 3 billion when they wanted a fixed rate at 14.85%, decided to move out. They thought that this will help to destabilise the economy, which was politically-driven. But they did not know that we are tougher and wiser in acting before. Now everything of that has gone out but the reserves have remained stable. There is a surge in foreign direct inflows and stock market portfolio investments,” he pointed out. Finance Minister Ravi Karunanayake yesterday said that fiscal operations registered a notable improvement on both the revenue and expenditure fronts, resulting in the containment of the overall budget deficit within the envisaged level of 5.4% of Gross Domestic Product (GDP) in 2016. He said that the favourable response was a reflection of the financial discipline brought into the system by the coalition Government and he believed that things could be improved in the future. “We predicted a budget deficit of 5.7%, but due to prudent economic management we ended up at 5.4%. This is a tremendous improvement,” he added. The Minister highlighted that the improved revenue was not a result of increasing taxes but was due to revenue slippages from the Excise Department, Inland Revenue Department and Customs Department. “I want these results increased, but there is a tremendous increase that is taking place. Those were the contributory factors to increasing the fiscal space. As a result the fiscal deficit has reduced and consolidation is taking place,” he stressed. In terms of the expenditure, the Minister said that they were able to bring it into a meaningful and more controlled level by introducing cost benefit analysis, internal rate of return (IRR), economic return and so on. 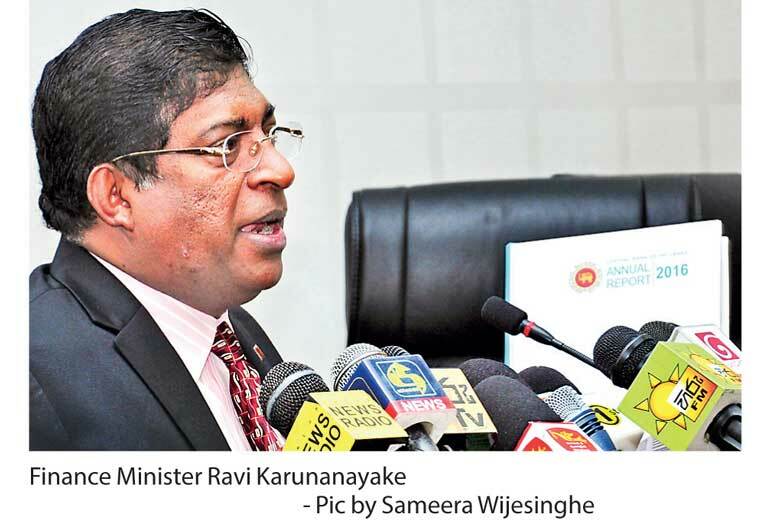 Karunanayake acknowledged that the improvement in the fiscal policy was also commended by the World Bank and the International Monetary Fund (IMF) at recent meetings. “The World Bank and IMF did accept there was a tremendous improvement. However, on the monetary side certain rectifications are needed; but I am sure we both can work together,” he stated. The Minister said the 2016 Annual Report will be presented to Parliament within the next two weeks.